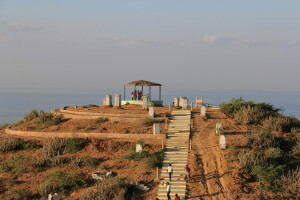 Kalo Dungar or Black Hill is the highest point in Kutch, Gujarat, India, at 462 m. It is located at 97 km from District headquarters of Bhuj and 25 km from nearest town Khavda. This is probably the only place in Kachchh from where a panoramic view of the Great Rann of Kutch is possible. Kalo Dungar or Black Hill is only 47 kms away from Kutch Resort.